Freyr is an experienced occupational therapist who has conducted clinical research primarily in the field of brain injury rehabilitation. She has extensive clinical experience across the continuum of care with clients with complex neurological conditions, particularly following brain injury. 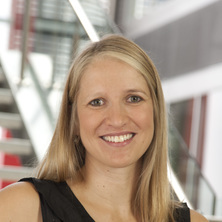 Her PhD, conferred in 2019, explored occupational therapy groups in traumatic brain injury rehabilitation. Her current research has extended on her PhD topic to explore the use of occupational therapy and multi-disciplinary groups in occupational therapy practice, and both inpatient and outpatient rehabilitation settings. She is also focusing on the educational needs of clinicians and students relating to the facilitation of group interventions, and the role of participation and measures of participation in group interventions. She is passionate about opportunities for collaborative research with clinicians, service providers and clients that leads to meaningful translation of research findings into clinical practice. She currently works in a teaching and research position in the School of Health and Rehabilitation Sciences. Group therapy interventions: Freyr is engaged in clinical research, extending from her PhD studies, exploring the use of group therapy interventions across the continuum of care and with a variety of population groups and clinical contexts. Brain Injury: Freyr has substantial clinical experience working across the continuum of care with client’s following brain injury. She is interested in the patient journey and exploring occupation-based therapy with this population group. Student education: Freyr has been involved in the development, implementation and evaluation of a new model of practice placement in an inpatient brain injury rehabilitation setting. This has progressed to current research investigating the health and economic impacts of rehabilitation groups that are resourced and led by students, with a focus on the student experience of learning in this model of practice placement. Rehabilitation Groups – What is Unique about Groups in Traumatic Brain Injury Rehabilitation? Review of group therapy in inpatient brain injury rehabilitation. Ninness, Nadine, Patterson, Freyr and Griffin, Erin (2012). Evaluation of a Student-Led Groups Program in Inpatient Brain Injury Rehabilitation. In: Occupational Therapy Queensland Conference, Cairns, Australia, (). 13-15 September 2011. Patterson, Freyr (2011). Reflections, opportunities and lessons learned from teaching Occupational Therapy in Bangladesh. In: Occupational Therapy Australia 24th National Conference, Gold Coast, Australia, (). 29 June - 1 July 2011. Fleming, Mary-Louise, Parker, Elizabeth, Gould, Trish and Patterson, Freyr (2011). Training the work health force for chronic illness: the challenges. Paper. In: 41st Public Health Association Australia (PHAA) Conference, Adelaide, Australia, (). 26-28 September 2011.